The Australian Skate Park League (SPL) is coming to Lithgow Skate Park on Saturday the 19th May as part of the NSW League. The Australian Skate Park League is one part of YMCA’s national pathway program that visits skate parks in QLD, SA, TAS, NT, WA & VIC. 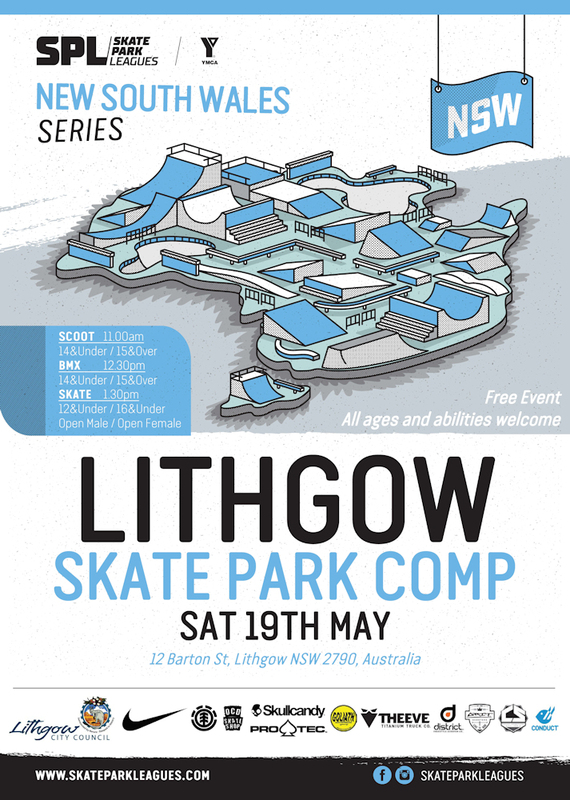 The Lithgow round is a skate park event that will feature Scooter, BMX, and Skateboard competitions. With the addition of skateboarding to the 2020 Tokyo Olympic Games, the series presents as a great opportunity for young skateboard enthusiasts to harness their skill base and progress through a structured national pathway. In addition to the pathway, each regional series of the SPL presents opportunities for young people to gain experiential practical training in skate park event management. The growing network of more than 1,450 participants ensures the success and longevity of the SPL, further enriching and celebrating skate park user communities. YMCA in conjunction with participating councils facilitates more than 90 SPL events a year, making up the Australian Skate Park League – the biggest and most established grass roots skateboard, scoot and BMX series in Australia. The Lithgow round has been brought to life through a partnership between YMCA NSW and Lithgow City Council.